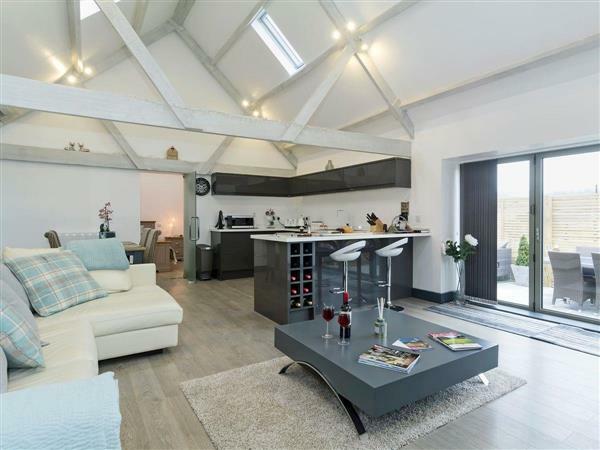 The Dovecote at Avon Farm Cottages in Saltford, near Bath, Somerset sleeps 2 people. Avon Farm Cottages near Bath is set within the owner’s 230-acre arable farm; these three outstanding properties are decorated to a high standard, and each boasts a large open plan living area. There are goats and chickens on the farm, so if you are up early enough, you can help yourself to some fresh eggs or take a look round the stables. Guests have access to the 230 acres of land, which includes the River Avon, where you can do a spot of fishing (licence required). Take a walk through the farmland and you reach the local pub, which is situated on the bank of the river. The farm is also 2 minutes away from the Bristol and Bath cycle track, perfect for cyclists and walkers, and the property is close to Saltford Sailing Club. Surrounded by open countryside, Saltford is also known for its history and has a conservation area, with a restored brass mill (dating to 1720), an old manor house and a church with a Saxon tower. Just 16 miles away is the vibrant heritage city of Bath, which boasts the famous Roman baths, Thermae Bath spa, and the famous Royal Crescent, which is one of Bath’s most iconic landmarks. There are also several National Trust areas nearby, including Dyrham Park and Stourhead House. The shop, pub and restaurant are all 1 mile from Avon Farm Cottages near Bath. Tythe Barn (ref UKC1402 [Tythe Barn]), Meadow View (ref UKC2055 [Meadow View]) and The Dovecote (ref UKC2737) can be booked together with to sleep up to 10 people. The Dovecote is all on the ground floor. Living area: With wood burner, Freeview TV and bi-fold doors leading to courtyard. Kitchen area: With electric oven, electric hob, microwave, fridge/freezer, washing machine and beams. Bedroom: With king-size bed and en-suite with walk-in shower and toilet. Private parking for 2 cars. Small enclosed courtyard with terrace and garden furniture. Hot tub for 6 (private). 2 dogs welcome, to be kept on a lead at all times (working farm). All properties: Electric central heating, electricity, bed linen, towels, Wi-Fi and fuel for wood burner included. Welcome pack. 230-acre natural grounds (shared with owner and other properties on-site). Fishing on-site (free of charge, licence required). No smoking. Please note: No children under 2 years old, including babes in arms. There is an unfenced river in the grounds. Holidays at The Dovecote, Avon Farm Cottages run from Friday to Friday. Pets allowed at Avon Farm Cottages - The Dovecote. For a better idea of where Avon Farm Cottages - The Dovecote is, you can see Avon Farm Cottages - The Dovecote on the map below. Avon Farm Cottages - The Dovecote is in Avon; should you be on the lookout for a special offer, you can find all the special offers in Avon. It's always worth checking to see what is on offer at the moment. Do you want to holiday near Avon Farm Cottages - The Dovecote (UKC2737), you can see other cottages within 25 miles of Avon Farm Cottages - The Dovecote; have a look to find your perfect holiday location.